Spooky Suburb. What about some spooky story for today? We bring you some chills today. And what are the best spooky stories ever? You enter an abandoned house which sometime in the past was totally normal and a happy family lived. But, than some strange thing happens all of the sudden and everything turns wrong. Fortunately, there are specialists that understand these kind of cases, know how to act, how to find out who is the guilty guy, why does some bad spirit ruins the lives of people around and makes them scared to be in the neighborhood. Today we are introducing you with such a professional smart guy who will solve big problem. Eric is experienced detective for paranormal cases. In his city there is a suburb that represents huge danger for its citizens. Very often there have been testimonies that in the late night hours there is a spirit of a woman that scares the citizens of this city. Eric arrives on the property where the ghost appears wanting to communicate with her and to find out what is the reason for its appearance on this place. So, get into Hercule Poirot mood and enjoy! 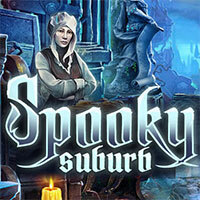 Spooky Suburb is a free online hidden object game on Hidden4Fun.